Posted: Wednesday 23rd January 2013 in eCommerce Technology, News, Thought Leadership. 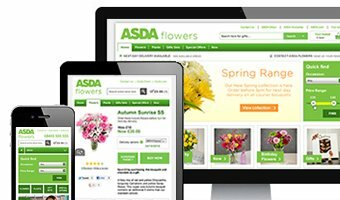 From today Asda customers will find their blooms of choice quicker and easier thanks to a new, improved Asda Flowers site. Asda is committed to staying ahead of the market while offering everyday low prices to their customers in a tough economy. With 6 of the top 10 UK retailers offering fresh flowers as part of their online gift range, Asda operate in a competitive market dominated by major players such as M&S, Next and Waitrose, alongside traditional florists Serenata flowers and Interflora. To cut it with customers, a site must let them find what they want quickly and easily and offer hassle-free purchasing. A winning site must be easy to use at home, in the office or on the move with mobile or tablet. And that means a responsive design. Selecting Magento as their preferred e-commerce platform, the site includes retail-specific enhancements to improve the site visit for customers, such as faster loading images and better site search. This is part of an overall strategy to grow Asda’s online revenue in 2013. And with Valentine’s Day around the corner, Asda will see the results of the new site very soon. For more information, contact Andy Brown on 020 7166 6333 or email [email protected].